The DOE is planning to rezone District 15 and expand the zone for P.S. 130 on Ocean Parkway and East Fifth Street. WINDSOR TERRACE — The Department of Education wants to rezone four elementary schools and create a new middle school to ease overcrowding in District 15, officials announced. The DOE unveiled the proposed changes at the District 15 Community Education Council meeting Oct. 8. The rezoning would affect P.S. 154 in Windsor Terrace, P.S. 130 on the Windsor Terrace/Kensington border, and P.S. 230 and P.S. 131 in Kensington/Borough Park. CEC 15 president Naila Rosario said the proposed rezoning came after "extensive conversation" with parents at all four schools — a welcome change for families who've felt shut out of DOE decisions in the past. "We're used to seeing things from the DOE from the top down, but this has really been a community process," Rosario said. "I'm happy to say there's a lot of community support for it." The new middle school, as well as a new special education school, would open in the fall of 2015 at P.S./I.S. 437, a five-story school building now under construction on Caton Avenue and East Seventh Street. The middle school would hold up to 345 students and the K-8 special education school would have up to 65 seats. The zone for P.S. 230 would also expand under the proposal, while P.S. 154 and P.S. 131 would see their zones shrink. Growing the P.S. 230 zone will reduce the need to bus students from overcrowded P.S. 169 and P.S. 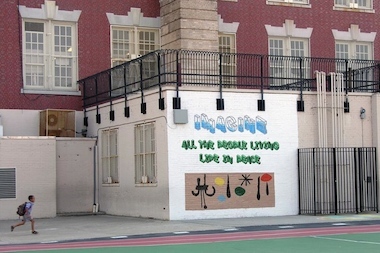 94 in Sunset Park to other schools, because many of them will now be in the P.S. 230 zone, Rosario said. “It’s going to definitely alleviate the crowding overall in the district,” Rosario said. The rezoning would expand the zone for P.S. 130 on Ocean Parkway and East Fifth Street and split the school into two sites. Pre-K through second grade students would stay in P.S. 130's existing building, and third through fifth-graders would move to the new P.S./I.S. 437 building. Under a previous proposal, the DOE considered carving up the P.S. 130 zone, a plan that made community members nervous, because it would have destroyed P.S. 130's diversity, City Councilman Brad Lander wrote in a blog post. Lander lauded the plan to expand P.S. 130's zone and split the school into two buildings. "The grades and classes will remain diverse, all kids will benefit from the new facilities, and the school community will remain united," Lander wrote. The CEC must approve the rezoning and the Panel for Educational Policy must approve the plan to split P.S. 130 into two buildings. The CEC is scheduled to vote during the first week of November. A date and location haven't been selected yet, Rosario said. The public can review the DOE's proposal for District 15 and submit comments on the DOE website.